Compute moments of an n-dimensional image. This class provides methods for computing the moments and related properties of a single-echo image. Computing the (non-central) moments of a large image can easily take a million times longer than computing the various other values derived from them, so we compute the moments only on explicit request, and save their values (in an ImageMomentsCalculator object) for later retrieval by the user. The non-central moments computed by this class are not really intended for general use and are therefore in index coordinates; that is, we pretend that the index that selects a particular pixel also equals its physical coordinates. The center of gravity, central moments, principal moments and principal axes are all more generally useful and are computed in the physical coordinates defined by the Origin and Spacing parameters of the image. The methods that return values return the values themselves rather than references because the cost is small compared to the cost of computing the moments and doing so simplifies memory management for the caller. It's not yet clear how multi-echo images should be handled here. Definition at line 60 of file itkImageMomentsCalculator.h. Definition at line 106 of file itkImageMomentsCalculator.h. Definition at line 105 of file itkImageMomentsCalculator.h. Definition at line 67 of file itkImageMomentsCalculator.h. Definition at line 102 of file itkImageMomentsCalculator.h. Standard image type pointer within this class. Definition at line 101 of file itkImageMomentsCalculator.h. Standard image type within this class. Definition at line 98 of file itkImageMomentsCalculator.h. Standard matrix type within this class. Definition at line 95 of file itkImageMomentsCalculator.h. Definition at line 66 of file itkImageMomentsCalculator.h. Standard scalar type within this class. Definition at line 80 of file itkImageMomentsCalculator.h. 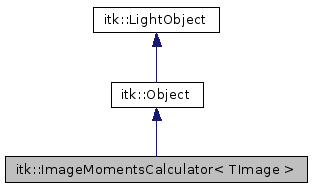 Definition at line 64 of file itkImageMomentsCalculator.h. Definition at line 90 of file itkImageMomentsCalculator.h. Spatial Object member types used within this class. Definition at line 89 of file itkImageMomentsCalculator.h. Spatial Object type within this class. Definition at line 86 of file itkImageMomentsCalculator.h. Definition at line 65 of file itkImageMomentsCalculator.h. Standard vector type within this class. Definition at line 83 of file itkImageMomentsCalculator.h. Compute moments of a new or modified image. This method computes the moments of the image given as a parameter and stores them in the object. The values of these moments and related parameters can then be retrieved by using other methods of this object. Return center of gravity, in physical coordinates. This method returns the center of gravity of the image whose moments were last computed by this object. The center of gravity is computed in physical coordinates. Return second central moments, in physical coordinates. This method returns the central second moments of the image whose moments were last computed by this object. The central moments are computed in physical coordinates. Return first moments about origin, in index coordinates. This method returns the first moments around the origin of the image whose moments were last computed by this object. For simplicity, these moments are computed in index coordinates rather than physical coordinates. Get the affine transform from physical axes to principal axes This method returns an affine transform which transforms from the physical coordinate system to the principal axes coordinate system. Return principal axes, in physical coordinates. This method returns the principal axes of the image whose moments were last computed by this object. The moments are returned as an orthogonal matrix, each row of which corresponds to one principal moment; for example, the principal axis corresponding to the smallest principal moment is the vector m, where m is the value returned by this method. The matrix of principal axes is guaranteed to be a proper rotation; that is, to have determinant +1 and to preserve parity. (Unless you have foolishly made one or more of the spacing values negative; in that case, _you_ get to figure out the consequences.) The moments are computed in physical coordinates. Get the affine transform from principal axes to physical axes This method returns an affine transform which transforms from the principal axes coordinate system to physical coordinates. Return principal moments, in physical coordinates. This method returns the principal moments of the image whose moments were last computed by this object. The moments are returned as a vector, with the principal moments ordered from smallest to largest. The moments are computed in physical coordinates. Return second moments about origin, in index coordinates. This method returns the second moments around the origin of the image whose moments were last computed by this object. For simplicity, these moments are computed in index coordinates rather than physical coordinates. Return the total mass (or zeroth moment) of an image. This method returns the sum of pixel intensities (also known as the zeroth moment or the total mass) of the image whose moments were last computed by this object. Extract the dimension of the image. Definition at line 109 of file itkImageMomentsCalculator.h. Set the spatial object mask. Definition at line 122 of file itkImageMomentsCalculator.h.